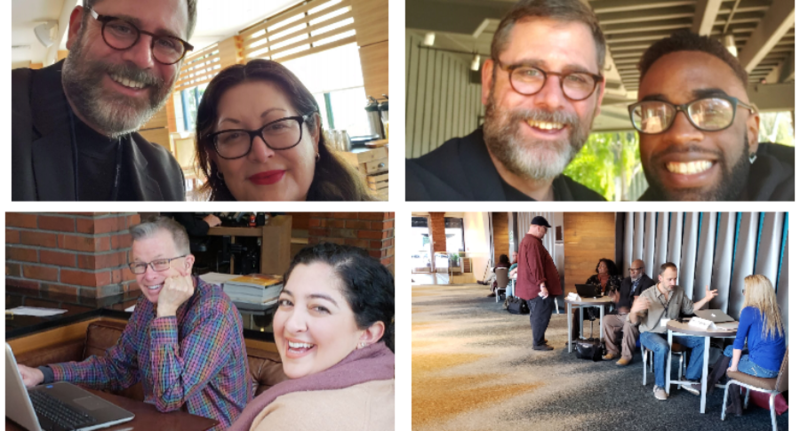 Saybrook’s recent Residential Conference, held from Jan. 19 – Jan. 23, was a chance for our online community to come together and meet face-to-face with students from around the world. From engaging presentations to documentary screenings, read President Nathan Long’s recap about the one-of-a-kind experience below. From the opening meal and session to program planning meetings (I loved Dr. Smikle’s admonition – the goal is not Ph.D. someday, it’s Ph.D. – Done”) to hearing students’ stories of how finding Saybrook has been transformational – I am inspired. I was impressed by several students I met today, including the young woman from Los Angeles who sees herself using her degree to make positive changes in communities that need support after being long ignored; and the gentleman from Seattle who seeks to use his degree to transform corporate practices from profit-centered to human-centered. I am inspired. And of course, our faculty and staff have been working to make this experience one that centers on a rigorous graduate experience centered on the unique qualities each of our students brings to our university. It’s been a terrific, uplifting, and inspirational first day of #SaybrookRC. Day two of the Residential Orientation (and the last day before the official Residential Conference begins) concludes. Today was a terrifically informative day filled with faculty meetings, student services orientation, Canvas (our Learning Management System) and Institutional Review Board training, meals, networking, and socializing. Given the intensity of the last day-and-a-half, the students I have had the privilege of speaking with seem upbeat and ready to dive into the official residential experience. I also found myself lucky to run into a few of our returning students pictured here. We kick off tomorrow with a range of activities including the Creativity Studies Luncheon. Looking forward to seeing some cutting-edge research-in-action! Today marked the official start of Saybrook University’s Spring 2019 Residential Conference. Continuing students joined their new colleagues for departmental gatherings, symposia, courses, meals, networking, and fellowship. You will also see pictured below students meeting with faculty advisors/mentors on various topics ranging from thesis/dissertation guidance to program planning. One of the highlights to the day was the Creativity Studies luncheon facilitated by faculty member Terri Goslin-Jones. The theme of the luncheon Muse and Memes showcased the research currently underway by various students including the use of art and music as therapeutic interventions. We were also treated to the talents of Ms. Jannelle Means who hails from Nashville, Tennessee, who began her presentation with “A Natural Woman” by Aretha Franklin. As a musician myself, I really enjoyed her take on how she has helped advance a group called Soul Vibes Collective to build community among musicians fostering an additional creative outlet outside of their day gigs. I was pleased that Ray Bailey, our online support specialist, gave us an overview of who he is, what he does, and why he loves Saybrook University. Ray’s energy, commitment to serving students and faculty, and his drive to help Saybrook humanize the virtual experience all are reasons were fortunate to have him here with our team. We ended the day with lovely tributes to Dr. Louis Hoffman and Charles Piazza. Student and faculty tributes were quite moving, offering powerful tributes to two great contributors to the Saybrook mission and legacy. In all, it was a terrific start and looking forward to more activities over the coming days. In between meetings, I was able to make my way into a couple of sessions, including one hosted by Dr. Jerry Devore who was speaking on biofeedback techniques. In just a one-half hour, I learned about Martin Rossmann’s book “Guided Imagery for Self-Healing”, the Ignatian Approach, the technique of Sustained Selective Attention, and much more. My reading list for this Spring just doubled in size! At noon for this year’s Diversity Luncheon, our Saybrook U community had the honor of hearing Dr. Karen Naifeh, a Jungian analyst, speak about the Jungian construct of the shadow and cultural complex in her presentation titled “Encountering the Other: The White Shadow”. As always with these experiences, the speaker really stretched those in the room to think how our daily work can be used to both raise consciousness and change society. Powerful. In between sessions, I was able to snag the busy Drake Spaeth to provide a brief overview of his role and a perspective on Humanistic Psychology. Dr. Spaeth, while relatively new to Saybrook, has been a long-time admirer of Saybrook U. His passionate articulation of who we are is indeed inspirational. Take a look when you have a moment. During dinner, students across the university convened to discuss the formation of a new student government. Observing students in action who deeply care about their university was awe-inspiring. The attendance at the event was incredible. The day ended with what was described as an incredibly powerful student-faculty panel presentation on the recent TCS Education System study abroad trip to South Africa. Many stories of cross-cultural learning, relationships, and increased understanding from the perspective of the participants made this session truly impactful. Another terrific day at the Saybrook RC. Another full day of learning and excitement was had by all of our Saybrook U students. The day culminated in our feature event for the Residential Conference: the screening of Charm City (short-listed for an Academy Award nomination and screening on PBS in the not-too-distant future). This powerful film – timed to be shown on Martin Luther King, Jr. Day – depicted the lives of Baltimore residents, politicians, and law enforcement personnel all of whom were working to find a way to reduce the violence plaguing their community. Heartbreak, love, and desire to advance social change were all poignant themes that emerged. We were fortunate to have Dr. Sahar Driver (faculty member in TSC’s Social Impact Specialization) and the film’s director, Marilyn Ness, join us for Q and A following the film. Great community dialog and visioning for how we can empower each other and our communities to nurture change despite the significant odds. Today was yet another day of rich activities and classes. These pictures capture the work going on in a range of classes and social activities across the various programs. We also held to important town halls hearing questions and comments from students, faculty, and staff. After each town hall, I had the opportunity to meet with students to identify solutions and action plans. I was also pleased to get a minute with Dr. Tom Hayashi, Department Chair of Leadership and Management. Take a look! Thank you, Katie Horton, for taking the time to speak about yourself and your Saybrook experience! Check out her video here. Lastly, thank you, Saybrook University Community, for a truly powerful week in which we empowered one another to make positive social changes among ourselves, in our organizations, and our communities.